With a form-based interface, journal users can search the Living Reviews in European Governance reference database. This database stores all the bibliographic citations, online and in print, which have ever appeared in the journal. Users enter one or more search criteria into the form. These criteria are then submitted to the search engine using the Search button. The search will return only those references that match the specified criteria. In certain fields, users can enter multiple criteria and specify the relationship between them. In some other fields, menus provide criteria options. The Entering Search Criteria section, below, offers detailed information on each search field. Search results can be handled in several ways, accessible via the form on the side bar of the results page. Results can be exported in various formats and returned to the browser or sent via email. To do so, choose a format from the dropdown menu, optionally enter your email address and hit the Export button (hidden behind the dropdown list of formats in the screenshot). For more information on this, see the Output Format from a Search section, below. Note: Exporting is only possible for less than 100 search results (total). You can also refine a search (i.e. specifying additional search criteria) by hitting the Refine button, or start a new search hitting New. All text input fields understand the boolean operators "AND", "OR", "NOT" with the usual precedence. Thus it is possible to formulate queries like "Font, J.A. AND Müller, E. AND NOT Papadopoulos, P.". This field allows users to search by author or editor of a given work. To input author names correctly, it is recommended to use the list of all available author names provided when clicking the "Author(s)" link on the form. Alternatively, the last name only may be provided as input. This will result in a somewhat "fuzzy" search; i.e. names which only differ slightly (read: in non-ASCII characters) from the name provided as input will be counted as matches as well. Living Reviews in European Governance authors provide keywords for each reference they cite. Journal users can search the reference database using these keywords. The Keyword(s) field has an active link to a list of all keywords attached to the references in the database at that time. By clicking on the link a small window appears showing all possible keywords. In this window one can then navigate all the possible keywords. Clicking on any of the keywords places it in the search form. 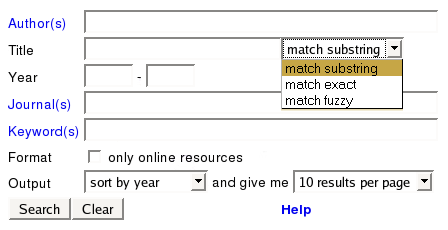 This field allows users to input criteria on the titles of references to match their search. Three search modes are available: "substring", "exact" and "fuzzy". When using the mode "substring", any reference will match whose title contains the text entered in the title field. When searching for "exact" title matches, only references with exactly the title entered in the title field will match. "fuzzy" mode goes further than "substring" in the follwoing respect: The input entered in the title field is compared to titles of references on character level - allowing for a certain difference - as well as on word level. Thus, while the "substring" search for "waves gravitational" will not match the title "Stellar Collapse and Gravitational Waves", "fuzzy" search will. Using "fuzzy" search, the above mentioned title will also be matched by the query "Stellar Colapse and Gravitational Wave", because it is only "2 characters distant". Note: The criteria entered in the title field will also be used to match "booktitle" or "conference title" fields of references. Users can search for all references published in a journal. The Journal(s) field has an active link to a list of all journals attached to the references in the database at that time. By clicking on the link a small window appears showing all possible journals. You may try this here clicking on the headline! Users can search for references published in a particular year (filling in the first year input field only) or in a range of years (giving the inclusive limits by filling in both year input fields). Years must be entered as 4 digit numbers (example 1998). Search results can be restricted to references for which a link to online resources is provided by checking the "List only online resources" box. If a search results is less than 100 hits, the results can be exported to the formats listed below. For users of bibliographic tools like RefMan or EndNote we added export filters in the appropriate formats. The XML export format may be useful for further automated processing of search results. That's actually what we do. All other export formats are derived from this XML. The XHTML output is very similar to the regular results page stripped off the form elements. The XHTML output may be useful to put a reference list on the web. The URL used to retrieve the search results may even be incorporated as link in other web pages to have the same search executed each time the link is clicked. The only caveat here is, that once the search results in more than 100 references (for example because new references have been added), the link will only resolve to an error page. We are using references in BibTeX format for article processing. This export format may be used, to incorporate references in an existing BibTeX database. References can also be exported as XML serialization of Dublin Core metadata using the Resource Description Framework. Again, this format is intended mostly for further automatic processing, in particular by web crawlers. Living Reviews in European Governance has implemented COinS to enable links from the search results to your link resolver. Guidelines, browser plugins, and examples how to use COinS are provided by the Max Planck Society and Openly Informatics. Refining a search might be easier than coming up with complex boolean queries right away. Make sure to set your browser's "Character Encoding" (typically in the "View" menu) to something like "auto-detect" or "utf-8". If you have additional questions about our search facility, please, contact .